My favorite morning while I was at home started the night before with my nieces coming home with Momma and me. Unfortunately for Momma, she had to go to work the next morning, but it allowed me some quality time with the girls. Being the fabulous Auntie that I am, I let them sleep in (aka more coffee time for me!) but it wasn’t long until they were stirring and Reese with her sleepy eyes mumbles “Where’s Grammers?” She’s gone to work. Reese thinks about it for a second and then with a pouty and determined face asks “Well, then who’s going to make me breakfast?” Me. At that answer, I receive a very dubious glare and after about a 5 second glare-down, she announces “I guess I better help you.” I appreciate your vote of confidence. As I’m assembling ingredients and mixing pancake batter, Reese pulls up her Cooking with Grammers Stool to the countertop near the stove to keep an eye on me. At this point older sister Landri comes in, asks if I’m sure I can make breakfast like Grammers and when I exasperatedly answer yes, also offers her help–just in case. SIDE NOTE: When my mother cooks her beloved grandchildren and great-nieces breakfast it’s an all out affair. But the most special part of breakfast is that she makes everyone their own pancakes in the shape of the first letter in their name. Of course, this once prompted a discussion between Landri and her mother (Lauren) because teasingly Lauren said that she got all the “L” shaped pancakes. Landri, who was probably about 5 or 6 at the time, very pointedly informed her that her name was “Momma” and Grammers would make her “M” pancakes and leave her “L’s” alone. This, of course, brought great-nieces Morgan and Malory into the discussion because they didn’t want to share their “M” pancakes. 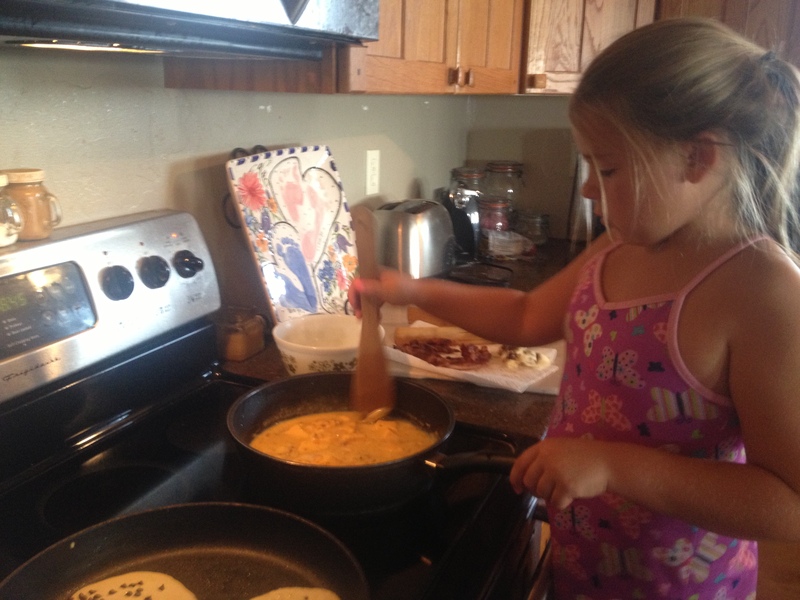 Grammers did what any grandparent would do–got up and made more pancakes! So this is what I’m up against. 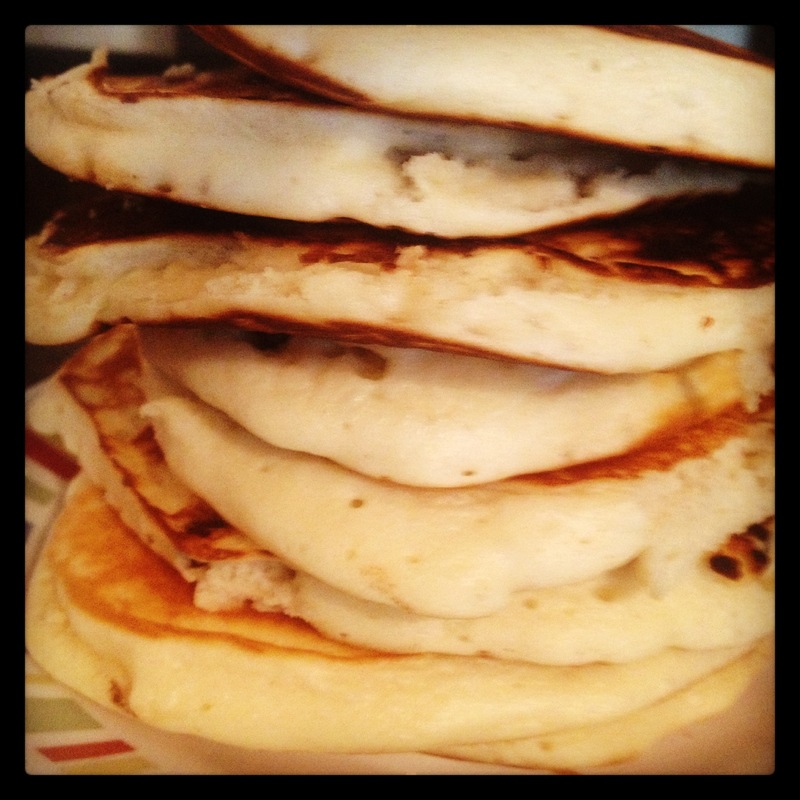 But you’re getting pancakes with chocolate chips in them. 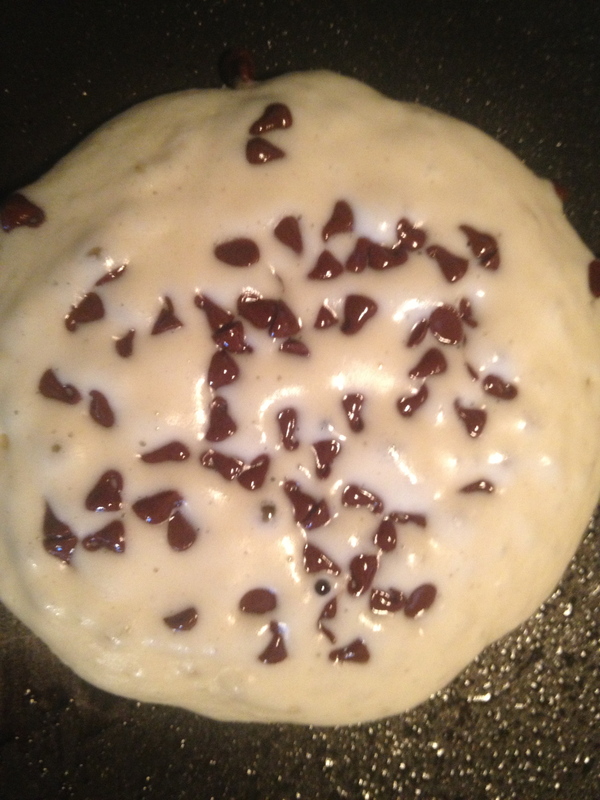 Does Grammers make you chocolate chip pancakes? Reese: No. But she makes us shapes! Why isn’t Grammers here? She’s working. So tough. Focus on your eggs I don’t want shells in them! After Reese and I go over the plan: crack 8 eggs, put them in the bowl, and then whisk. I start helping Landri with the pancakes. Once I was assured Landri had the chocolate chip dispersing down pat, I checked on Reese, who is just watching us. “I can’t crack the eggs.” Why not? “I don’t know how.” Okay. So I show her. Crack it hard on the counter and then at the cracked part, push in slightly, and pull the shell apart. It took a couple of eggs and a reminder to crack the egg like a rockstar (not daintily, as she tended to do), but soon she got the hang of it. TWO PIECES OF ADVICE when letting a 6 year old crack eggs: 1. Make sure their hands are clean because they will be handling way more of the egg than one would ever imagine. 2. Check and double check for shells. After a bit of nail-biting whisking, we pour the eggs in a skillet and throw some cheese on top! Reese is now in charge of stirring and at this point Morgan has rolled out of bed and–announcing that she feels confident in our ability to finish, Landri went to watch TV with Morgan. Reese and I soon make quick work of our breakfast–which was a resounding success, despite there being only round shaped pancakes. The only negative comment: Landri said that the eggs were “too cheesy.” What the what? Reese, Morgan, and I agreed: NO SUCH THING! A Perfect Stack: Fluffy AND Chocolatey!